October is Breast Cancer Awareness month. In honor of my sister Susan who passed away at the age of 36, I built a very special Bourbon Barrel Guitar. Since launching my company, I have been in search of bourbon barrels suitable for my custom guitars. While browsing barrels, I stumbled upon one that was covered in pink paint. While most would think that this pink paint had ruined the barrel (in terms of its “Bourbon” heritage), my first thought was Susan. The barrel head came from a warehouse in New Albany, Indiana and there was no marking on the head to indicate which distiller had used this barrel. Bourbon barrels are often reused to store other spirits. My understanding is barrels like this often have painted indicators on the heads to indicate the contents of the barrel. We think this one was used to store brandy. 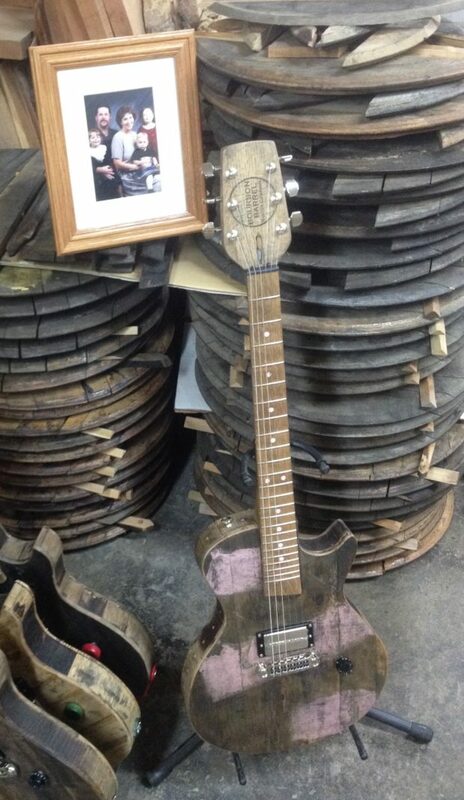 When I looked at this barrel head and thought of Susan, I knew I had to build a guitar to honor her memory. Like all of my guitars, this guitar is built with 100% of the wood coming from a used bourbon barrel. The pink paint gives this guitar instant character that distinguishes it from the others. Since I built this to coincide with Breast Cancer Awareness Month, I decided to embed 36 pink crystals into the body sides of the guitar to honor Susan’s 36 years of life. Additionally, the fretboard inlays are hand-molded pink and white swirl dots. As my company is brand new, I am not sure what I am going to do with this guitar. My dream is to sell it or auction it off to raise money for research, prevention and possibly a cure someday. If you are interested in this guitar, please contact me. This is a very special guitar.Susan, this guitar is for you, built with love. For more information about Breast Cancer Awareness Month, visit the National Breast Cancer Foundation, INC. To see more Bourbon Barrel Guitars, visit my online gallery.